When it first appeared in 1899, Kate Chopin’s The Awakening was greeted with cries of outrage. The novel’s frank portrayal of a woman’s emotional, intellectual, and sexual awakening shocked the sensibilities of the time and destroyed the author’s reputation and career. Many years passed before this short, pioneering work was recognized as a major achievement in American literature. Set in and around New Orleans, The Awakening tells the story of Edna Pontellier, a young wife and mother who, determined to control her own life, flouts convention by moving out of her husband’s house, having an adulterous affair, and becoming an artist. Beautifully written, with sensuous imagery and vivid local descriptions, The Awakening has lost none of its power to provoke and inspire. 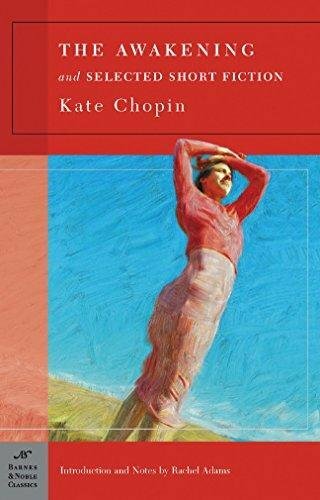 Additionally, this edition includes thirteen of Kate Chopin’s magnificent short stories including: Emancipation: A Life Fable, A Shameful Affair, At the ‘Cadian Ball, Désirée’s Baby, A Gentleman of Bayou Têche, A Respectable Woman, The Story of an Hour, Athénaïse, A Pair of Silk Stockings, Elizabeth Stock’s One Story, The Storm, The Godmother, and A Little Country Girl. This is a used, trade size paperback book in nearly new condition. Softcover, 256 pages.